Everyone in our house loves peanut butter so this recipe is definitely a family favorite. A few simple ingredients come together to make a delicious bar great for lunch time or snack time. If you’re a peanut butter lover… pour a giant glass of cold milk, grab a serving-sized blonde, find a quite spot to sit and enjoy a little slice of heaven. Preheat oven to 350 degrees. Spray a 13X9” baking dish with cooking spray. In a large bowl, beat peanut butter and butter together with an electric mixer until smooth. Gradually mix in brown sugar, eggs and vanilla extract. Add flour and mix until well combined. Pour batter into prepared baking dish and spread evenly in the dish. Bake for 30-35 minutes. Optional: Microwave until spreadable, 2-3 tablespoons of peanut butter. Spread over warm bars. Sprinkle with powdered sugar. Cool before slicing into bars. Bananas have always been a staple ingredient for lunch bags/boxes in our household. When selecting fruit to add to my weekly shopping list, bananas always take center stage. I often choose far more than needed for a week’s worth of lunches as I love having a few extra over-ripe bananas to add to tasty quick bread and snack recipes, such as this one. 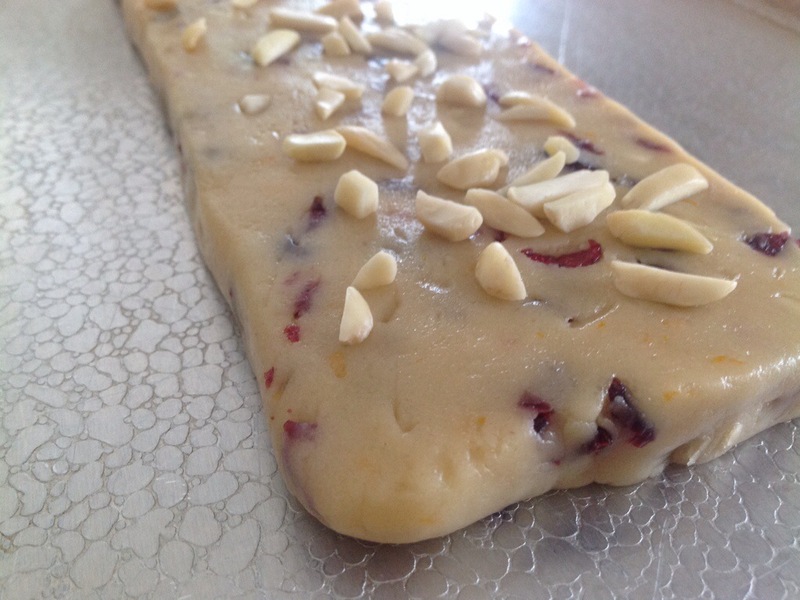 These delicious bars have few ingredients and highlight some of my family’s favorite flavors. My three (not so) little monkeys have enjoyed these flavors for many years. Preheat oven to 350 degrees and grease a 13×9” baking pan. Mix bananas with oats and peanut butter; add vanilla and continue to mix until well blended. Carefully, spread the mixture in prepared pan making sure to evenly distribute to the corners. Top with chocolate chips and walnuts. Bake for 18-20 minutes or until an inserted toothpick comes out clean. Cool before cutting into delicious squares. Wrap individually for a lunch bag treat or store in an airtight container. Note: Lately, I’ve been using the Copper Chef brownie pan to make perfect portions while baking. Depending on your oven, you may have to reduce cooking time when using this pan. Cool completely before removing insert. ﻿ ﻿For those of you trying to reduce the amount of refined sugar and processed white flour in your diet, this is a doozy of a cookie. I stumbled on a version of this recipe several years ago when the only readily available sugar substitute on the market was Splenda. Since then, the options are abundant when choosing sweeteners to add to baked goods. For this particular recipe, I use a mixture of unrefined coconut sugar and a brown sugar substitute blend to sweeten the batter. The result, an absolutely delicious cookie that everyone is sure to enjoy. Tuck them away in a safe place after they’ve cooled or they’ll be gone in no time at all! Preheat oven to 350 degrees. Lightly spray two cookie sheets w/ cooking spray. In a large bowl, combine the peanut butter, sweeteners, eggs and vanilla extract; mix well. With a small round ice cream scoop, press the dough into walnut-sized balls and place 2″ apart on the cookie sheet. With a tines of a fork, flatten the cookies in a criss-cross pattern. Bake 9-10 minutes or until just starting to turn golden brown. Wait a few minutes before removing from tray to cool on wire racks. Store in an airtight container. Over the holidays, we spent a few days in downtown Chicago where we visited a charming little store called Teavana. Housed in Water Tower Place, this was our first visit to the store. As we headed into the cozy shop, we were encouraged to taste-test a variety of deliciously fruity tea samples and admired all of the containers of loose leaf tea stacked high on tidy shelves lining the store walls. Well, after spending over $100.00 in purchases, we headed out the door with several pounds of tea, and a few Teavana trinkets that we convinced ourselves we absolutely needed. Arriving home, M and I decided to make a batch of Ginger and Spice Biscotti cookies to have on hand during our evening ritual (enjoying a cup of piping hot tea and watching the Hallmark Channel). …And there’s nothing like a warm cup of tea and a spiced cookie during the cold winter months living in the Midwest. Preheat oven to 375 degrees. Spray, with cooking spray, a cookie sheet. In a large bowl, mix together oil, sugar, eggs, and molasses. In another bowl, combine flour, wheat flour, baking powder, and remaining spices. Mix into the wet ingredients to form a stiff dough. Bake in preheated oven for 25 minutes. Remove from oven, and set aside to cool 5-10 minutes. Cut into 1/2″ thick diagonal slices. 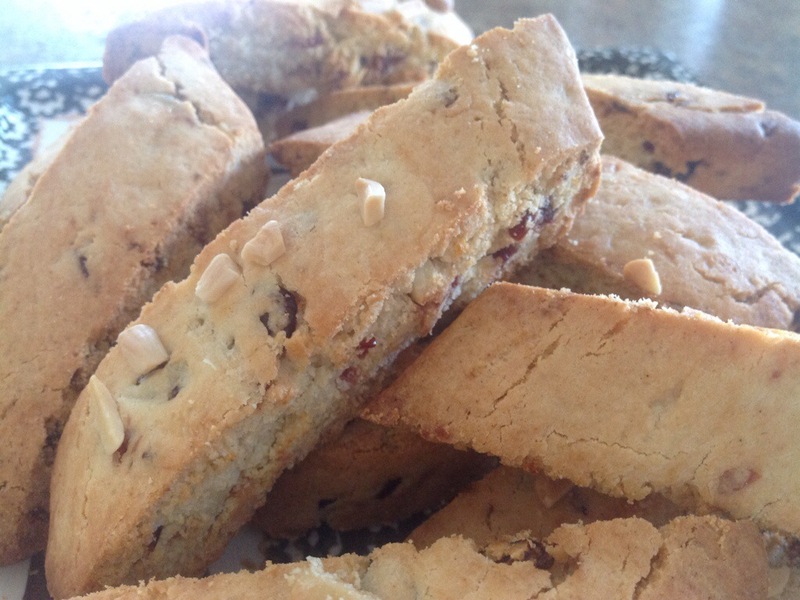 Place sliced biscotti on cookie sheet, and bake an additional 5 to 7 minutes on each side. Cool, store in airtight container. As I mentioned in one of my earlier posts, I’m all about sending goodies to my college kids living on campus. Receiving a thoughtful care package from home is always a welcome surprise for students. Last week, while I was visiting campus, I dropped off decorative trays of Holiday Cutouts to each of my children. I’m told they were a big hit as M shared her tray with her Resident Assistant, roommate and a few of her friends from home. K and P shared their cookies as well. M confessed that she couldn’t imagine eating too many of the cookies without putting on a few pounds so, “out of site, out of mind”, was her motto when passing off the tasty treats to friends and floor mates. Kids, no matter what their age, always enjoy a flavorful treat for the holidays. Preheat oven to 400 degrees. Cream together the butter and sugar. Add the egg, vanilla, and almond extract; mix until well blended. In a separate bowl sift together the flour, baking powder and salt. Carefully, add the dry ingredients to the butter mixture and combine well. Form the dough in to a smooth ball. Roll dough on a lightly floured surface to 1/4″ thick. 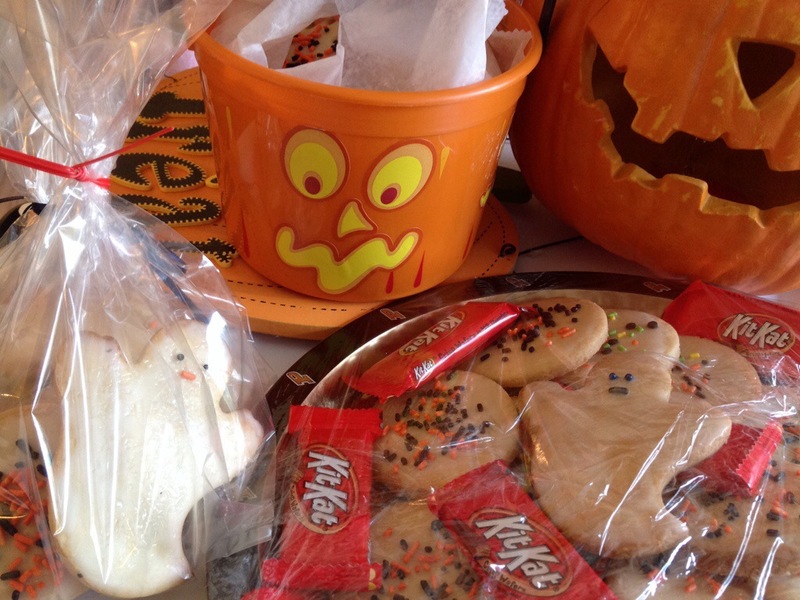 Cut out with cookie cutters and place on ungreased cookie sheets. Bake 6-8 minutes or until very lightly browned. 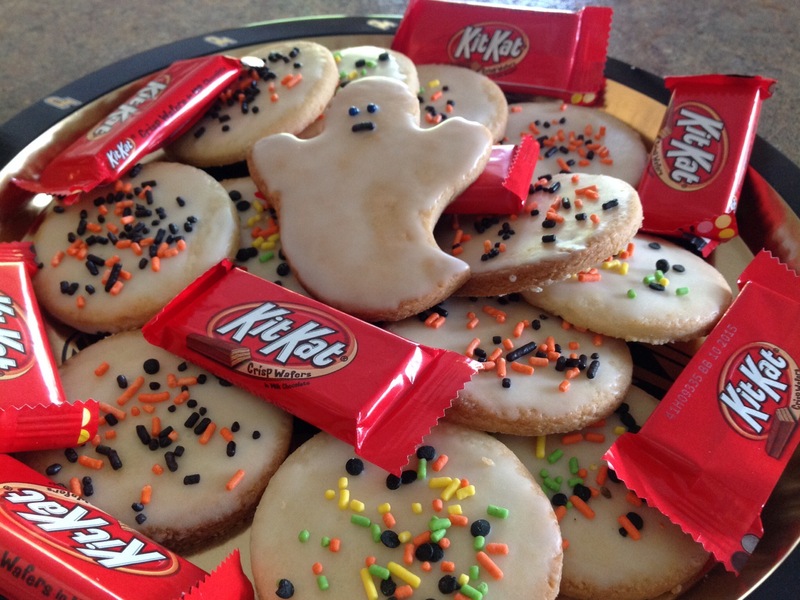 Remove from cookie sheets and cool on wire racks. Decorate as desired when cool. 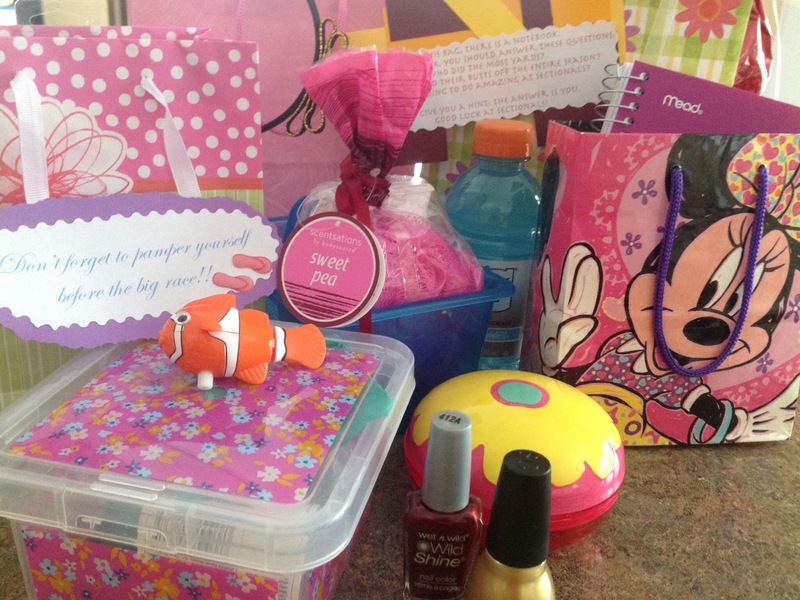 Every year, when the swim season is at its peak and our swimmers are getting ready for the big championship meets, the girl’s team picks a secret buddy to surprise with a week’s worth of little gifts. This week, M and I scoured the shelves of the local discount stores to find little trinkets and goodies to pack into colorful bags, each marked with an inspirational swimming quote. In the early morning hours, the girls sneak into the pool locker room and place the goodie bag in front of their “buddy’s” locker. It’s all in good fun and a welcome release from the daily grind of swimming yard after yard in the pool, during the long winter months. Yesterday, M surprised her “buddy” with a beautiful container full of Valentine Shortbread Cookies and a few other little trinkets. These cookies are kind of over the top in the “sweets department”. The recipe includes lots of creamy butter and a load of sugar. Certainly not something you’d want to munch on everyday. 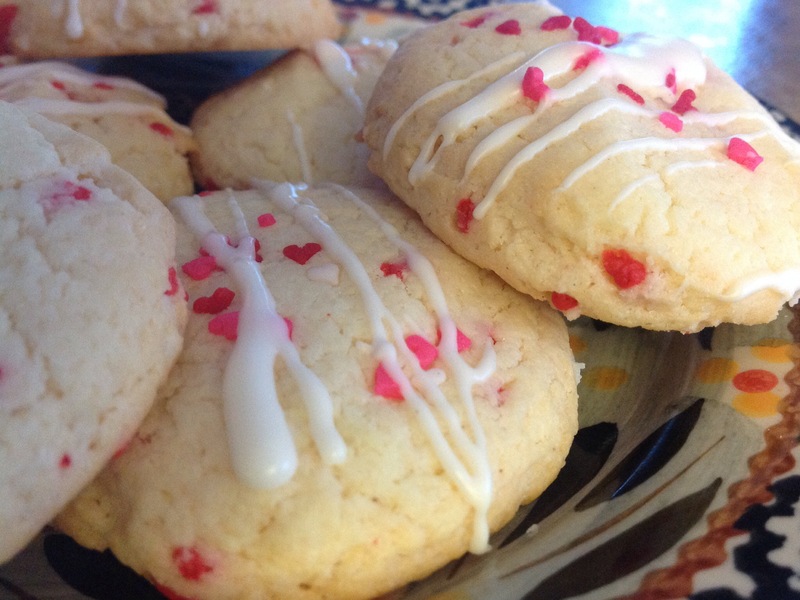 But for this special occasion, and for the upcoming Valentines Day holiday, maybe this is the cookie you’d like to make and share with your sweetheart! Preheat oven to 350 degrees. Cream together butter and sugar until light and fluffy. Stir in vanilla and almond extract. Carefully add flour and mix well. Gently fold sprinkles into batter. 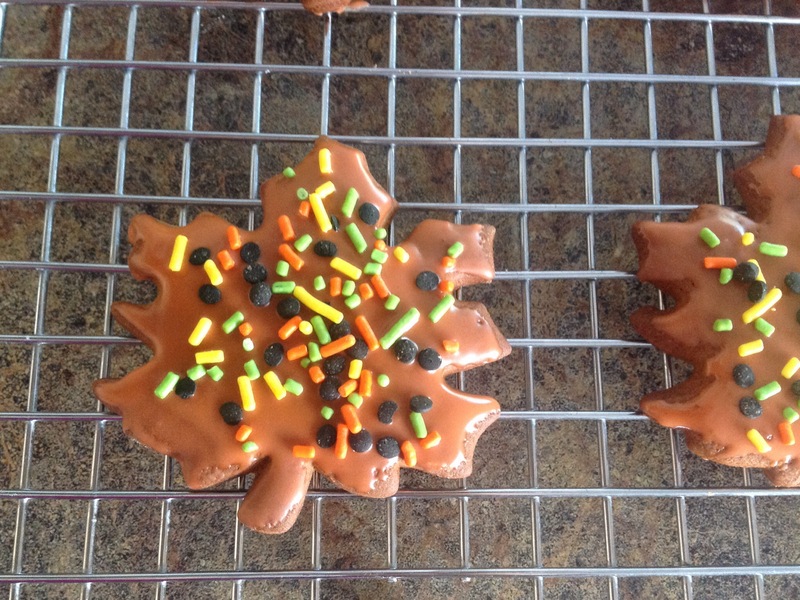 Using a small ice cream scoop, form cookies and place on baking sheets. Flatten slightly with the bottom of a glass or with slightly damp fingers. Lightly pat remaining sprinkles into top of cookies. Bake for 10 – 12 minutes. Drizzle with powdered sugar glaze when cooled. It’s that time of year…holiday parties, friendly gift giving, festive decorations and enjoying time with family. One of our favorite ways to spend time together seems to revolve around preparing and sharing cherished family recipes. We have a few favorite cookie and quick bread recipes that we always bake when the holidays roll around…some are time consuming recipes while others can be whipped up in a jiffy. 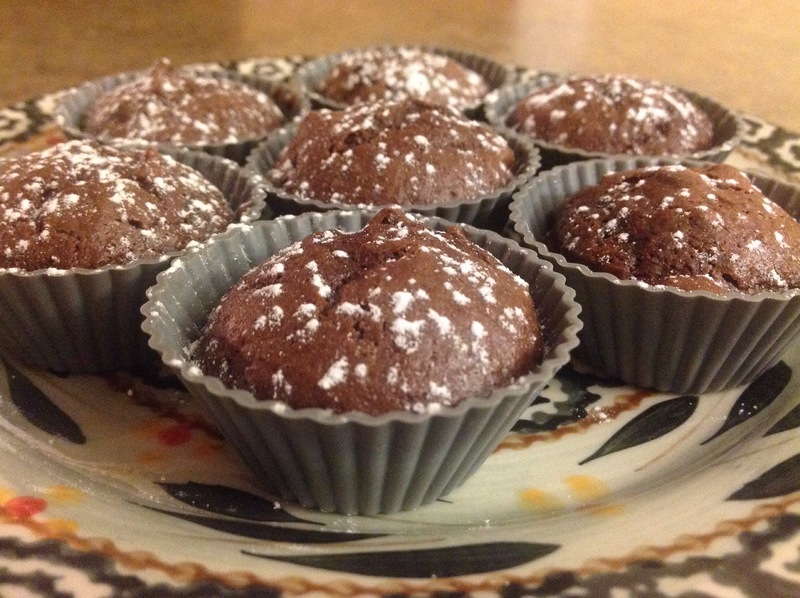 This recipe for Mini Brownie Bites is a quickie. These flavorful gems are a mouthful of rich, chocolatey goodness and they only take minutes to prepare. Be warned that the recipe yields only a dozen or so bites. You can bake them along with your favorite cookie selection to be added to the holiday dessert tray. I often pack them in colorful tins to give as teacher gifts. They travel well and seem to get more moist and delicious a day or two after baking. Be sure to store them in an air-tight container until just before serving. In a microwave, melt 1/4 cup of chocolate chips and butter; stir until smooth. Cool slightly. In a small bowl, beat egg and sugar. Stir in vanilla and chocolate mixture. Gradually add flour; fold in remaining chocolate chips and optional walnuts. Use a small ice cream scoop to fill mini paper or silicone-lined muffin cups two-thirds full. Bake at 350 degrees for 8-12 minutes (depending on how dry or moist you prefer the brownie center) or until tops begin to crack. Cool completely before removing from pan to a wire rack. Boy, is it cold outside. As I bundle up my kids for their 5:30 am swim practice, I think about how dedicated they are to their sport. I know it’s my job to supply nutritious and comforting meals to provide fuel for the day and I do my best to get the job done. 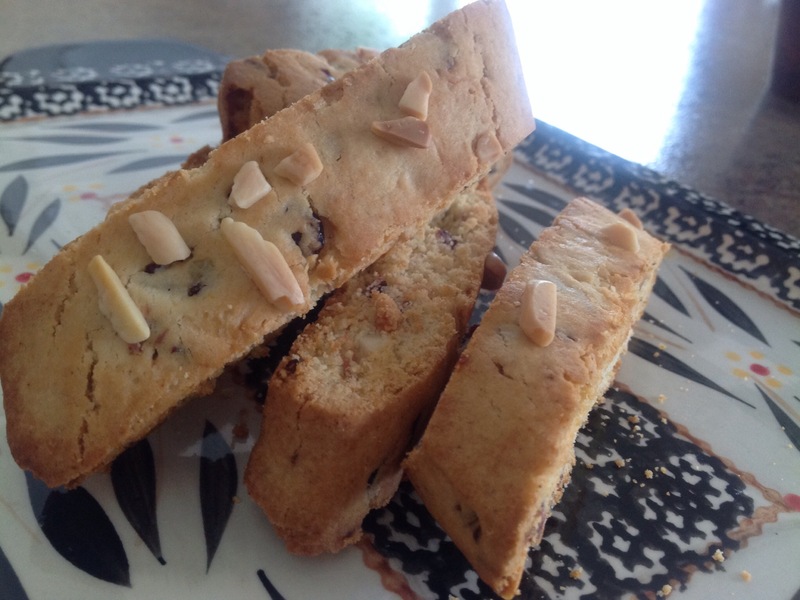 However, there is one indulgence that M requests for her morning snack at school… Cranberry Orange and Almond Biscotti with a cup of tea is her favorite cold weather snack. 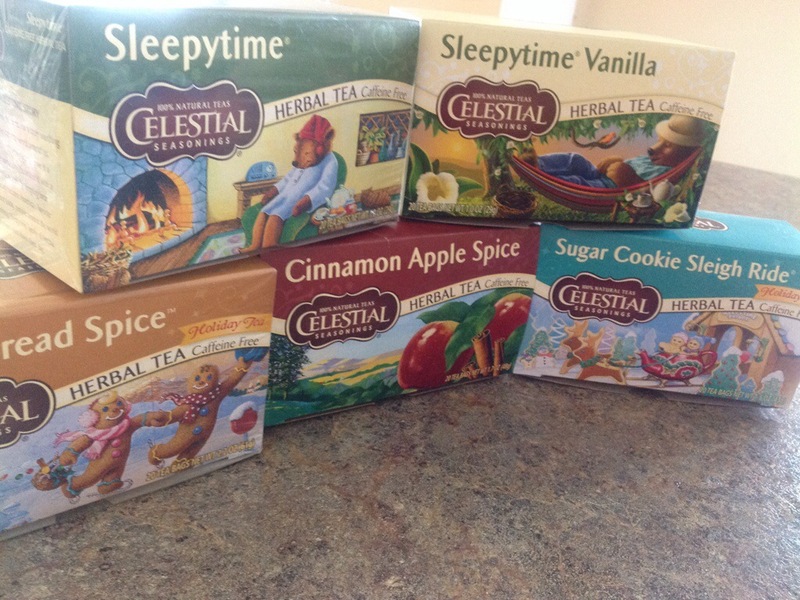 A couple of weeks ago, there was a decent coupon for Celestial Seasonings Tea. I had 5 coupons so I bought five of their holiday selection flavors for roughly 79 cents a piece. M was thrilled! 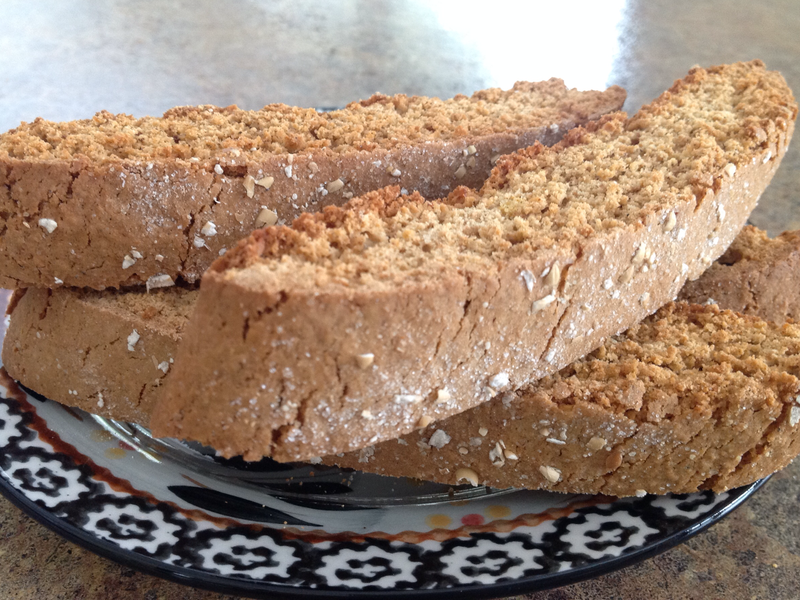 During M’s Saturday morning swim practice, I whipped up a batch of her favorite biscotti and brewed her a cup of tea. When she arrived home, she was so happy! Recently, I purchased M a wonderful thermos to take to school with her. So every morning, I brew her a cup of tea, fill up her thermos, and pack a biscotti cookie in her lunch box so that she can enjoy her snack during an early morning break. It’s a great way to warm her tummy during the cold (freezing cold) Midwest winter days. Heat oven to 350 degrees. In large bowl, stir together sugar, oil, orange peel, vanilla extract, almond extract, and eggs. Stir in remaining ingredients. Place dough on lightly floured surface. Knead until smooth. On two cookie sheets, shape half of dough at a time into two 10×3-inch rectangles. 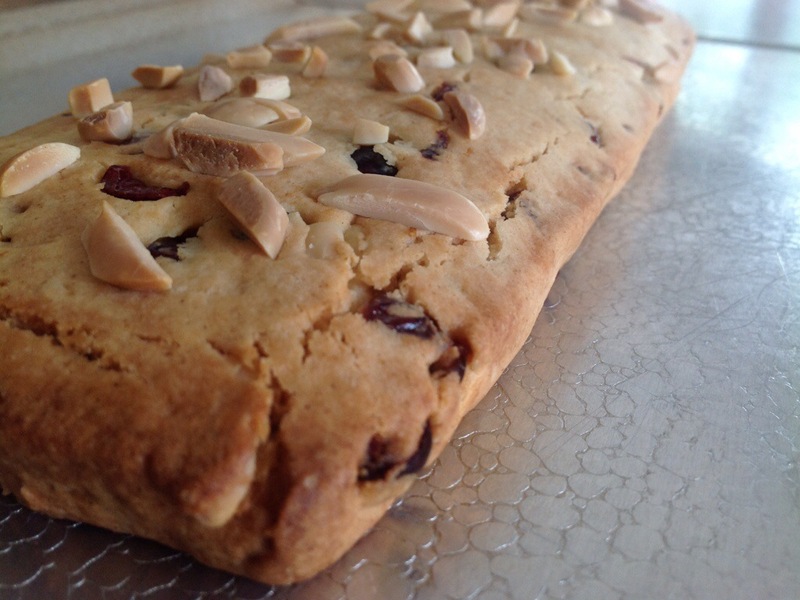 Press a handful of almonds into the top of each dough band. Bake 25 to 30 minutes or until toothpick inserted in center comes out clean. Cool on cookie sheets for about 15 minutes. Carefully cut rectangle crosswise into 1/2-inch slices. Turn slices cut sides down on cookie sheet. Bake about 15 minutes longer, turning once half way through, until crisp and light brown. Immediately remove from cookie sheet to cooling rack. Cool completely, about 30 minutes. I have a son that is super picky when it comes to dessert foods. He’s quite old-fashioned and loves only the traditional recipes that we’ve all known for years. Basic chocolate chip cookies (no nuts), plain ole’ brownies (no fancy powder sugar topping) and my famous peanut butter cookies. This is probably P’s most requested cookie recipe. 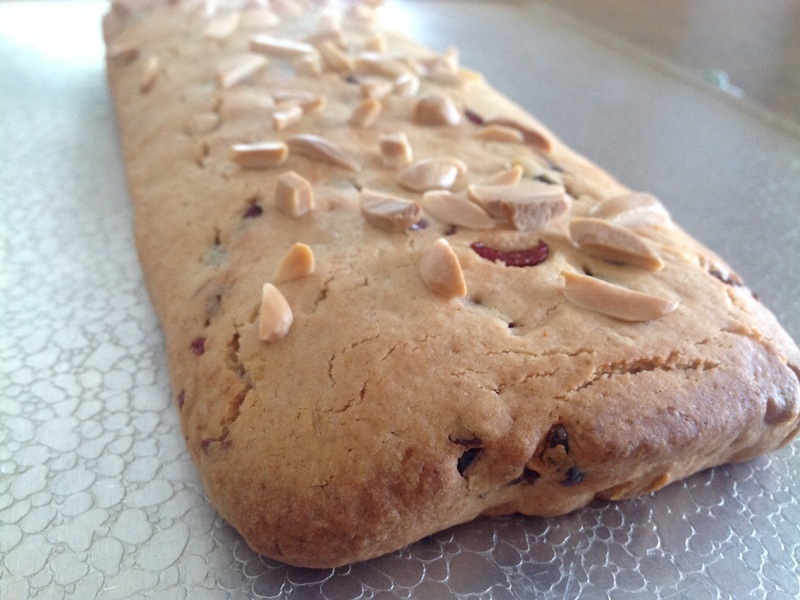 What I like about this basic recipe is that it is flour-less. 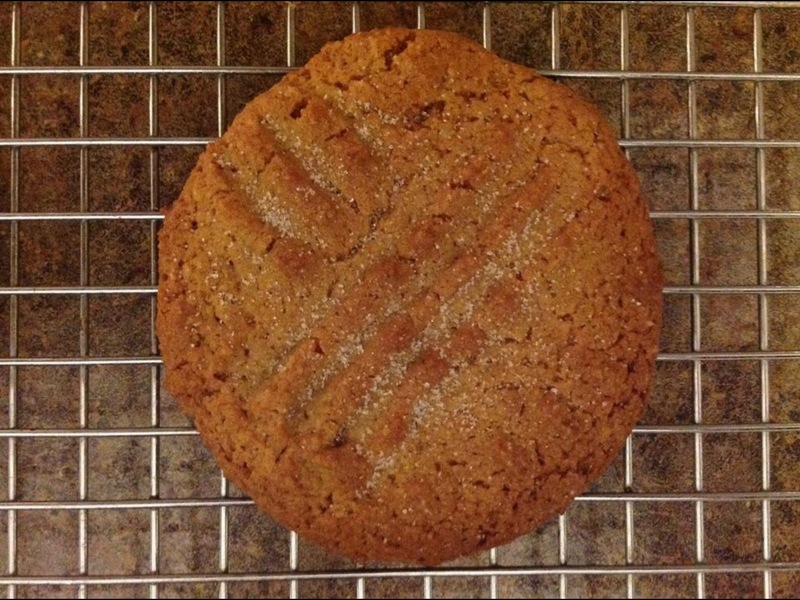 Mixing a few simple ingredients together produces a dense, flavorful cookie that everyone seems to enjoy. In the fall, I make these for all of our football tailgate parties because they pack so well. During the winter months, especially for holiday parties, I add a cup of chocolate chips to the mix for a heartier cookie. The combination of peanut butter and chocolate is a flavor that just can’t be beat! Preheat oven to 350 degrees F. Lightly spray cookie sheets with cooking spray. In a large bowl, beat eggs and sugar together until light and fluffy. Stir in the peanut butter. Next, stir in the baking soda, salt, and vanilla. Use a small ice cream scoop to form dough into 1″ balls and place them 2 inches apart onto the prepared cookie sheets. Press a criss-cross into the top using the back of a fork. Sprinkle with a little sugar. Gosh, I love this time of year…I am especially happy this week because my K is coming home from college for the holiday weekend! We have missed seeing her smiling face around the house. She is a student athlete so she hasn’t been allowed to come home since the beginning of the school year. Her most common complaint while away at school is that she misses mom’s cooking and baking. I will be starting on some of K’s favorite savory meals this afternoon. …Can’t wait to have the family back together for the holidays!